Natalie Korenic will help anchor the Richmond Devils’ blueline at the senior AA provincial women’s hockey championships Thursday, March 29 to Sunday, April 1 at the Richmond Ice Centre. Natalie Korenic started playing ice hockey at the age of six. But like many kids, she was playing street hockey long before that. Fast forward, and Korenic is now both playing and coaching the game she grew to love. 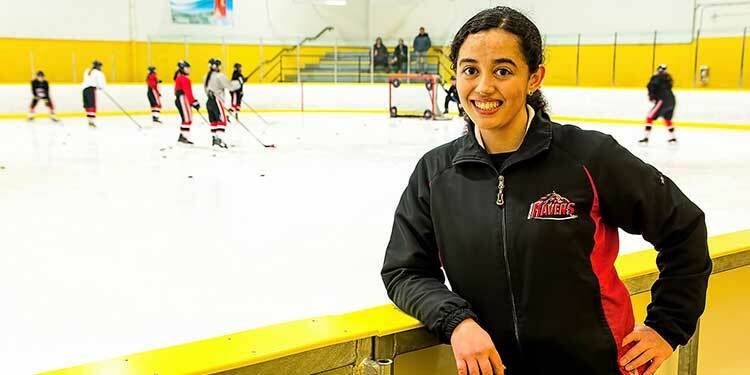 This weekend, she will trade in her place as an assistant coach behind the bench of the Richmond Ravens’ Peewee A team to suit up with the Richmond Devils, who are hosting the senior AA women’s provincials at the Richmond Ice Centre. However, she’ll doubtless be keeping an eye on the other action as the Richmond Ravens girls’ hockey association hosts its 21st annual Ice Classic. That event, also through April 1, features recreation teams at the Initiation, Novice cross-ice, Peewee, Bantam and Midget levels from throughout Western Canada and the Western United States. Women’s hockey has enjoyed strong growth globally. Korenic says this year’s Olympics was a perfect indication. While Korea didn’t have a good team, the fact they had a team at all shows we’re moving in the right direction. Not long ago, there were calls to take women’s hockey out of the Olympics because Canada or the United States consistently beat everyone handily. But as more countries begin developing their teams, with the Scandinavian countries in particular making big strides, Korenic sees a bright future. She says the fact NHLers didn’t participate in men’s hockey at these Olympics also meant more people were watching women’s hockey, and were awed by the skill. However, she stresses that level of exposure once every four years is not enough. There are two professional women’s leagues in North America, but no teams in B.C. And none of the players get paid much. Class valedictorian of her 2010 graduating class at Steveston-London Secondary School, _she is now business operations lead at Aspect Biosystems. The company is at the leading edge of 3B bioprinting and tissue engineering. But the visionary 20-something Korenic is taking a more traditional approach to the B.C. women’s championships. As cliche at it may be, she says the Devils are approaching them one game at a time. Korenic says there are no dreams of a pro hockey career for any of the players competing in this weekend’s tournament. They’re all either working or going to school, and hockey is a way to stay active or socially connected. Not unlike her own journey as a player, Korenic has coached every level of Ravens’ hockey. She is currently assisting with the Peewee A team. Korenic thinks it’s a misconception kids need to learn to skate before starting hockey. At the young ages, she argues, hockey is a great place to learn to skate. Korenic was one of only five players on her Initiation squad, making the Atom Bulldogs her first “real team.” But there was a wide range of ages, the youngest player being five and the oldest 10. With female hockey still in its infancy, such age gaps were typical in her first few years. She played Peewee for five years between the ages of seven and 12. The Midget season was similar. Having coached more than a thousand games during his long, and decorated, coaching career, Sander has contributed to the development of female coaches as much as anyone, Korenic suggests. Korenic doesn’t know what specifically sparked her passion to coach, just that it was there. She wanted to help young players, just like those who helped her. In her 12 years of minor hockey, Korenic had two such assistant coaches in Dana Pretty and Katie Malysh. After coaching with the Midget A team for the last three years, Korenic realized she missed working with a younger age group. She credits Peewee A head coach Gord Taylor for inviting her to join the staff. One of the biggest differences is the tenacity and physicality required. Korenic says everyone wants to win, especially the top prize at the end of the year. And she believes it’s important players work towards these goals. But at the end of the day, it’s important to put things in perspective and measure success by improvement. She says communication is another key to success. But for whatever reason, younger players in particular have a hard time grasping its importance. As much as Korenic loves hockey, though, she eventually needs a rest. And she’s looking forward to an off-season.